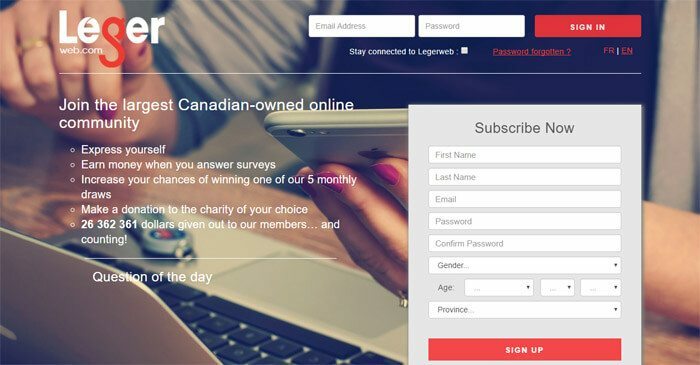 Can You Really Make Money With The Leger Web Survey Website? This website seemed pretty interesting right from the beginning. It had an attractive home page, and was said to pay out actual cash when you answer surveys. But can you really make money with the Leger Web survey website? The landing page had an attractive background, and contained quite a bit of key information. Here is a run-down of my first impression. So, my first impression of the site was pretty good. There was a sign-up form to the right, some information to the left, and a login form at the top. To-date, approximately $26,362,361 has been awarded to members through this site. That seems like a lot! So I was excited to see if I could make any sort of substantial money while using it. The reason behind why I do research like this is because I have a theory about survey websites. I feel like the right survey website could, in theory, make an awesome side-hustle. I’m all about earning some extra cash, and websites like this give users the opportunity to make flexible cash without much trouble. The only problem tends to be in exactly how profitable the sites are (or aren't). As it turns out, I have had a hard time finding survey sites that pay out enough to make them worth the time. So that is the number-one biggest downfall to most surveys/panels that I’ve encountered. But would Legerweb.com prove to be any different? The next part of my research consisted of going through the FAQ page. I was actually quite disappointed with this page, as it only had 4 questions on it. I did manage to learn that you can cash out in increments of $20 at any point (so you have to earn $20 before you can expect to cash out). You can also redeem ‘Air Miles’ in increments of 20. But for the most part, that was the most important/interesting thing I was able to learn through the FAQ section. So I visited the ‘About Us’ page, and found a few more details. First of all, I learned that this panel was founded in 2004… so it has been up and running for quite some time. It is, at this point, the largest Canadian-owned web panel, with 400,000 active representatives in Canada. The company has business addresses in Montreal, Toronto, Quebec, Edmonton, and even Philadelphia in the US. At this point, I had pretty much learned all that I was going to learn about the site from the outside. So it seemed that the time had come to sign up. I went back to the home page, and started filling out the subscription form. Here is what happened. To start with, I needed to supply my email address, date of birth, and name. I also needed to create a password. Once I passed that screen, I was asked to update my contact information. Here, I was asked to supply my address and my phone number. I was also asked to choose a language, and to pick out the type of reward that I would want to receive. For the reward options, you could choose dollars, Air Miles, or Aeroplan. I was not entirely sure what Aeroplan was, but I still opted for dollars. Once I got this done, I got a message telling me that my contact information was updated. I dismissed the message, and went back to the home page… which was now my ‘main hub.’ Here is what it looked like. So here is a look at what my main hub looked like at this point. At this point, you can see quite a few different things. 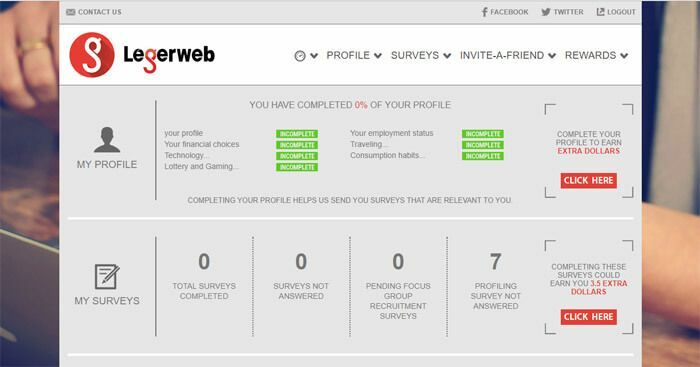 You can see that my profile is not complete, that I have 7 profiling surveys that I have not completed, and that I have the potential to earn extra money by doing both of these things. This sounded great to me, so I decided to dive right into a survey to get things started. Here is a look at the first 3 profiling surveys I had access to on Leger Web. As you can see, each one was supposed to take anywhere from 3 to 5 minutes, and each one paid out 50 cents. You also get ‘5 chances’ for something with each one, though I was not totally sure what that meant at the time. Anyway, I decided to go ahead and take the first one. I clicked on the ‘Participate’ button, and was taken to a screen that briefly explained it. Here, I was able to discover exactly what the ‘5 chances’ thing meant as well. If I completed this survey, I would be given 5 chances to win the monthly draw… so that was a pretty cool detail. At any rate, I moved forward. The first page of the questionnaire basically asked me information about myself. I was asked about my education, my occupation, what languages I speak, what my ethnicity is, etc. I was then taken through several pages of the survey, and ended up answering quite a few questions. I had to answer questions about my parents as well, such as where they were born, etc. In total, this survey probably only took 3 minutes, if that. It was pretty short, and I earned 50 cents for it. I also got 5 chances to win the monthly drawing. I had other surveys that I could take to earn a bit more money, or I could finish filling out my profile to see what that could get me. I also visited the ‘Pending Surveys’ page, to see if I had any more paid surveys waiting for me. But alas… I did not. I figured that I would need to complete my profile before I would get any though, and that is understandable. How Did Leger Web Perform Technically? From a technical standpoint, I didn’t have any problems with this site. Some of the buttons on the survey were a little weird. At one point, I wasn’t exactly sure what to push to skip a question that didn’t apply to me. I got it figured out without much of a problem, though. I have seen better survey layouts before. But really, all things considered, the site did a pretty good job. I liked a lot of things about this site. I liked how it looked and how it performed. I liked how in-depth the profile creation process was, and I liked that you got paid to set up your profile and fill out profiling surveys. I also like that it gives you payment for surveys, plus monthly entries into giveaways. I am usually not the type to pay attention to giveaways, but it is always nice when they are included for free as part of the process. I also liked how the surveys were put together. This panel has been operating since 2004, so they obviously have some experience. But will Leger Webs prove to be everything I need in terms of a side-hustle? On that note, I am afraid not. If you enjoy taking surveys, then this survey site would be a good choice for you. You could take surveys, get paid for them, and win entries into the sweepstakes in hopes of winning one or more of them one day… and there is certainly nothing wrong with that. But my purpose for researching survey websites is to find a quality side-hustle. I need to find a side project that I can invest my time into that will really earn me some extra cash. I could then, in turn, use this cash to either help me pay my bills, or I could invest it into another side hustle to earn even more. But on this note, I am afraid that LegerWeb.com just didn’t hold up. It’s a great survey site for people who love survey sites, but I’m afraid that it just didn’t have what I needed to commit to it in the long run. Should you sign up for it and use it to earn some extra money?